Enhance your experience of London’s landmarks on a private 3.5-hour tour of central London. Alongside your private guide, you’ll visit iconic monuments such as Big Ben and the Houses of Parliament. Absorb the architectural charm of Covent Garden; browse the designer shops on Oxford Street; and gaze at Nelson’s Column in Trafalgar Square, home to the impressive National Gallery. Learn about the history and culture of the English capital and receive personalized attention from your guide throughout this private tour. After greeting your private guide at a central London location, you’ll be introduced to landmarks such as Big Ben and the Houses of Parliament — two iconic London structures. 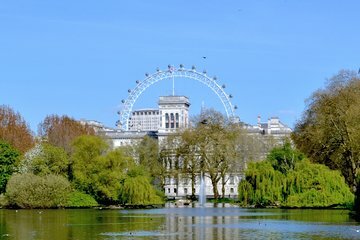 Then, admire the exterior of Westminster Abbey and submit to the verdant splendor of St James’ Park, home to elegant swans and diverse flora, as you make your way to Buckingham Palace. On arrival at Her Majesty the Queen’s official residence, you’ll hear of the building’s history from your guide and admire the elaborate architecture of Buckingham Palace. Then, browse the designer boutiques of one of Westminster’s best shopping streets before you revitalize in a local café with coffee, cake or cream tea at your own expense. Sated, prepare for the crowds of Picadilly Circus — often compared to Times Square in New York — before exploring the quaint, cobbled streets of Covent Garden and its famous piazza. Browse bespoke boutiques and enjoy performances from entertainers before bidding your guide farewell at a central location. Wow! This tour was really just the best way to see London in a day! We decided to come to London at the last minute on our way to Paris so we had no time to research things and we decided to book a tour that would cover some of the essential things to see but that at the same time was not going to be too mainstream. Neon, our guide was amazing and so interesting!! We were so pleasantly surprised to learn that he's actually a writer and journalist and only guides in his spare time because he loves showing people around. And it really showed because he was so keen to hang out with us and we had lots to talk about. I was initially worried that we were going to get a bored guide who was going to do yet another tour like yesterday's but it really was quite the opposite! It was such a joy to have Neon around to show us the city. And the tour was all about us. I really was not expecting that. Neon just went along with what we wanted to do and he took detours to show us things he thought we'd enjoy seeing without missing out on all the main sites. It was really cool to be able to take a turn and disappear from the mad crowds of tourists into beautiful secluded areas with hardly any people! I don't understand why some of these places are not mentioned in guidebooks! But that's fine by me as we can now say we've seen more of central London in one day than most other tourists. And we got some really good photos too! And the cherry on the top was getting recommendations from Neon on what to see and do on our last day in London that were off the beaten track. We had dinner at the Jugged Hare in Barbican a really interesting part of town btw! as we wanted to try real British food. And if you believe the stereotype that British food is terrible, then think again! We are converts! If you want to see iconic London without having to follow the crowds of tourists like sheep then this is the tour for you!